Brexit and Bremain, why do we continue to bicker afterwards? I usually don’t blog about political issues, but I feel I need to get this out there. Firstly, that I should be compassionate and and attentive to the plight and suffering of others, and try to make meaningful positive change to improve their lives. Secondly, that I cannot care for others before my own fundamentally basic needs are met, as I would not be useful or effective in solving any problems if I am deficient. Ultimately this holds that the strong should use strength to help those weaker than them, and that this is the right, honourable and moral thing to do. So, where then does this fit with the recent ‘Brexit’ vote of the UK to leave the EU? What I see is a vote of self preservation and desire for self-determination, not a vote of fear and xenophobia. A vote to clean up house, and focus on internal policy and health care issues, not to keep people out and stem any tide of refugees or immigrants. I am an immigrant myself. Still, in the aftermath of the decision to leave the EU, the prime minister announcing his resignation, and the assurance from all involved that this is not about being any less European, I still continue to see shots fired between the Brexit/Bremain groups. If I’m honest, I have mostly seen this from Bremain supporters, and this is not very surprising. 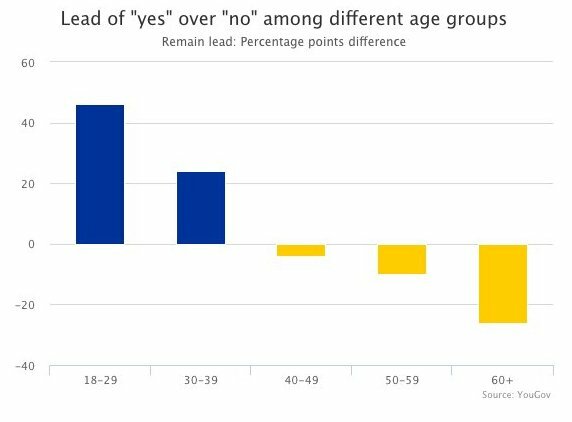 Just looking at the age groups that voted, it is clear to see that there is a divide between younger and older voters, showing the clear curve that mostly younger voters voted Bremain, older voters voting Brexit. This says a lot to me, like if more young voters actually voted then this could have been very different. Instead they chose apathy, and that is not an excuse in my opinion. It is also the responsibility of young people to encourage other young people to vote, rather than older people and politicians doing it. More importantly it is my own experience in the aftermath of my own family, friends, colleagues and acquaintances that concerns me the most. This is from personal interactions and also observations of reactions on social media such as Facebook and Twitter. -Straightforward insults and name-calling, that Brexit voters are “idiots”, etc. -Mocking and taunting towards Brexit voters, with a destinct ‘us-vs-them’ tone. -Calls that young people 16-17 should be able to vote. -Calls that “old people” should not be able to vote. -Threats and intentions to sign a second EU referendum in the UK. Still, I have seen relative silence and a distinctly small amount of gloating or showboating by the Brexit voters and political representatives. If I’m honest, it’s this that represents truly British culture to me, to maintain a stiff upper lip in the face of adversity, and regardless of this I find it noteworthy. I have also noted that most of this negativity is from younger people, and it concerns me that youth culture may be encouraging this kind of behaviour, that people feel it is acceptable to publicly scorn others on their views. This is after we have made such progress with many diverse equality issues such as LGBT rights, among many others that I wont list here. The fact remains that the majority have spoken, and it is more damaging for all of us to continue to bicker and flip-flop on far-reaching decisions like this. It is my hope that we can come together, as a nation, to capitalise and benefit on the unique opportunity that has been presented to us. We can shape our own country and lives for the better, by having the freedom to determine our own future and destiny. It is without a doubt a frighteningly risky proposition, and one that requires us to question ourselves, and each other, of the integrity and stamina we each have to make this work. Still, I feel it is a endeavour worth following. I want the UK to continue to be the multicultural and innovation capital of the world. I also want the UK to fix the broken and failing systems that we know should not be failing so, like the NHS. I want us to simplify and be transparent, as that in my experience is the best way to scale successfully, rather than obscure and muddle the task ahead of us with contempt. I guess there should be more blog posts like yours. Thank you! This is already an aged post, the topic isn’t though. So I felt I leave a comment. A don’t agree with you on some of your statements. Generally why would younger people be responsible for encouraging older people to vote? The way you state it, as a general rule, this makes no sense to me. Seniority comes with responsibility and experience. Youth comes with a tendency to introduce change by trial. In history it has always been the older generation passing on wisdom and culture to the younger one. Not the other way around. Stating it the way you do to me seems like pointing the finger at the wrong group. About your observations of negativity towards Brexit voters and the relative silence of them. I think your observation is probably generally correct. But c’mon how obvious is that? The winning party is silently happy while the losing one is sad and angry. I’m sure this never happened before in history. You state observations and you offer some judgement based on them. Yet you fail to offer probable motivations for this negativity. Your argument seem to lean towards protecting these poor Brexit voters while putting quite the burden of responsibility on the Bremain voters. Setting aside the question of “Is it right or wrong to Brexit?” I think there are some indisputable objective observations to make about the whole process. 1. As a reason to Brexit you state self-preservation instead of fear. However I you look closely at yourself you’ll find that fear is the driving force behind self-preservation. Calling it self-preservation doesn’t make it driven by some rational well thought out plan. It’s still fear. 2. The Brexit politicians actively tried to induce fear using made up arguments (for instance, the money thing). If you’re already a fearful person you’ll accept made up stuff supporting your fear because you want to protect yourself. A person needs strength to act against that. You were talking about strength in the opening of you article. 3. An outsider observing both groups must notice: Of course the one group is angry and sad because it observed another group introducing a huge change affecting both groups. While it made its decision for that change based way more on emotions than on rational thinking. Brexit is a territorial thing about demarcation, ego and the felt need for protection. Also the idea of “being consumed and tied” (whatever that means) by some other, larger entity – the EU for instance. In an increasingly open world such a sentiment is quite understandable, I’d say normal. It needs a lot of individual and also general political strength and explanation to deal with this and continually try to see and find the good in this openness and the constant and speedy changes introduced by globalization, while also sorting out the bad stuff. Brexit tackles that with a sledgehammer. Out of fear and the unwillingness or incapacity – whichever comes first – to deal with complexity and unknown situations (OMFG refugees!). It’s a redneck decision. That alone doesn’t invalidate it. But still, smart thinking on the part of Brexit proponents could have opened the door for knowing how to actually handle a Brexit. It’s about consequences of ones actions. Children don’t care about that. And it seems like some grown-ups don’t care as well. Again, it’s not about Brexit right or wrong. It’s about doing something big without having the slightest idea (or being ignorant) how to handle it. And you bet people are going to be angry because of such behaviour on a society wide scale. So, why all the bickering you ask? Firstly, my deepest thanks for responding. I’m glad you took the time to read and respond. Second, at the end of the day this isn’t a discussion board, but a personal blog so I’ll frame my response in that context. It’s honestly based on my opinions and thoughts, and I don’t see anything wrong with that. Also, by the virtue of my response, personal attitude, and the public nature of my blog I welcome and happily digest other opinions that challenge my own. Still, despite all of this, I find that your response here has personified a few of the conclusions in the article I wrote. I did actually also write a follow-up to it, but it was never published as I don’t intend this to be a political blog. I’ll try to answer some points that you’ve made as succinctly as I can, though I am sure I will fail. I can ramble sometimes. You’re right, it is somewhat obvious that Bremain voters are quite salty about the apparent ‘loss’, but I wouldn’t describe this as a win/lose for anyone. The key difference is that we live in a time of unprecidented change, which is the idea that frames much of my thought process these days. We are seeing things all over the world that we never expected or could imagine happening, from politics to technology and lifestyle. One such unprecidented thing is social media networks and, in my opinion, how they can bring out (Or at least provide a podium for) the worst aspects of people. Also the best, but its usually the worst in my observations. My argument isn’t about protecting anyone, its about accepting reality, and moving on… I have had to do this many times in my own life as an immigrant minority in Europe. I don’t complain about it, and expect the same from others. The fact that the (Social network active) younger generation is more represented in the Bremain voters, it is unsurprising to me that they have a way of making the most noise also. This issue, in my eyes, is about self preservation and not fear. Fear is to stay with what you know, rather than take your future into your own hands. You can’t blame anyone else for your own decision, but you can if you follow instructions. I relate this myself by moving to a completely different country, and I cannot describe to you my own understanding of how deeply bone-chilling a decision it is to leave what you know behind. I would argue that following a prescribed plan is just as fearful, because it is based on a lack of control. Lets be honest, both ‘sides’ of the political battle tried to sow fear. In particular our ex-prime minister sowed the most fear, in arguments of safety and staying in the EU-bloc. What will we do if we leave and fail? THAT is indesputable fear-mongering. For the outside observer, just as the UK observes America in the recent election, one thing rings clear to me of how similar we are in our decisions. The way I see it, when you ignore people for long enough, when you tell them how unimportant and monstous they are, eventually the time will come where they get to choose what happens. If anything, the recent US political story has mirrored our own UK Brexit struggle in that under-represented and demonised groups have crystalised in a way that the popular liberals did not expect. I’m not going to support that this is about territory or ego, because as I’ve said its about self-determination, which I support fully. Unfortunately, the EU has become a lot more than it was originally envisioned to be, and I think much of its trouble has been based around efforts for a single currency. The Euro is clearly about the ends, not the means, examples of bullied countries in its wake. Where did that get us? Something important we need to remember is that Brexit/Bremain is a binary decision, there is no middle ground. No “maybe”, its in or out, as it should be. Unfortunately, any binary decision causes devide because it doesnt cater to any one person exactly and draws a clear line in the sand. You have to pick as side, no matter how moderate you want to be. So yes, it is a sledgehammer of a decision, but that is exactly how it should be. The rest of your comments are passionate, but are a bit of a rant, I think. Rednect decision? “OMFG Refugees!”? Talk of ignorance and not caring. I will say that nobody “knows how to handle a Brexit”, because as I said before, we live in a time of unprecidented change and this is one such example. This has never happened before, nobody has left the EU, there is no playbook or precident here. We shouldn’t look for one, we should forge forward and lead, as the British have in the past. We should be proud to lead, and do unprecidented things. There’s not enough of that in todays world. Again, thanks for commenting, it means a lot to me.